Eight Rolls-Royce Trent 1000 TEN engines in Air New Zealand’s fleet of 13 787-9s will be inspected sooner than anticipated after Rolls-Royce identified high pressure turbine (HPT) blade deterioration when testing batches of the engine. Singapore Airlines grounded two Boeing 787-10 aircraft on April 1 after discovering the blade deterioration in their Trent 1000 TEN engines during a routine inspection. The aircraft are out of service until the engines are replaced. The grounding and identification of premature blade deterioration it its samplings resulted in Rolls-Royce agreeing with Europe’s safety regulator, the European Union Aviation Safety Agency (EASA), to accelerate inspections of the engines. At least seven of Air New Zealand’s Trent 1000 TEN engines are replacements for the earlier model Trent 1000 “Package C” engines that knocked five Air New Zealand 787-9 aircraft out of service because of blade corrosion and cracking problems in 2018. Air New Zealand leased three aircraft from EVA Air and Singapore Airlines while those engines were inspected, repaired or replaced. The last 787-9 to join its fleet was after the launch of the Trent 1000 TEN engines and probably had this latest engine installed at the time of delivery. 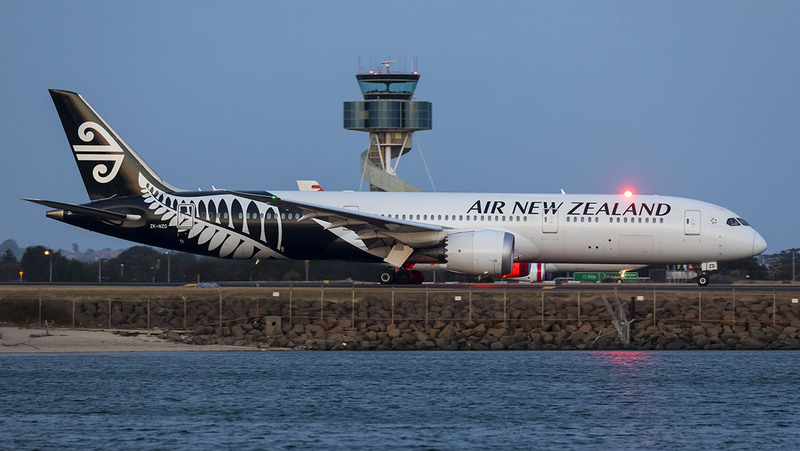 An Air New Zealand spokesperson said on Thursday the EASA airworthiness directive did not require any immediate action but would increase the frequency of future checks. “This may have some schedule impact going forward and we’re currently working through what that might be,” the spokesperson said. Any disruption caused by more frequent inspections would be another knockback for Air New Zealand, already suffering a $NZ30-40 million ($28.3-37.7m) hit from the global recall in 2018 of the Rolls-Royce Trent 1000 “Package C” engines over the durability issues on the intermediate compressor rotor blade. In its January 30 2019 investor update, Air New Zealand said Rolls-Royce engine issues continued to be challenging for the business, both commercially and operationally, but were expected to improve as the year progressed. 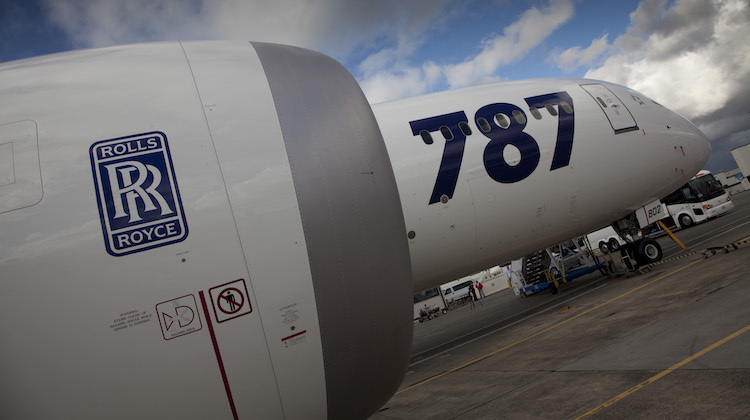 There are about 1,000 Rolls-Royce Trent 1000 “Package C” engines in service powering Boeing 787-9s, including with Air New Zealand, All Nippon Airways, British Airways, Virgin Atlantic Airways and Norwegian Air Shuttle ASA. Rolls-Royce said in a statement on Wednesday (European time) that it had contacted its customers to work out a plan to inspect more than 180 Trent 1000 TEN engines put into service since the engine’s launch in November 2017. Rolls-Royce president of civil aerospace Chris Cholerton said the blade deterioration was a known issue but was occurring faster than the company had expected in some engines. The company said it had communicated to airlines that the HPT blades in these engines would have a reduced life and a small number had needed to have their HPT blades replaced earlier than scheduled. “We started development of an enhanced blade last year, which we are now testing. 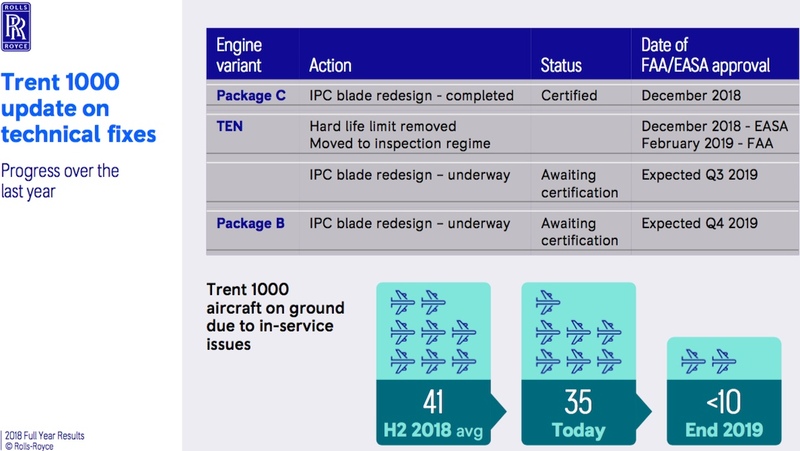 We expect to start incorporating enhanced blades into the Trent 1000 TEN fleet in early 2020,” Cholerton said, while apologising to customers for the disruption the accelerated inspections would cause. “These inspections will allow us to confirm the health of the Trent 1000 TEN fleet and to improve our understanding of the HPT blade deterioration that we have seen in a small number of engines,” Cholerton said. Rolls-Royce has been focusing on engines that experienced a higher frequency of flights at the upper end of their operating range. The grounded Singapore Airlines jets operated on fairly high cycles on routes to Japan, Korea and Thailand. 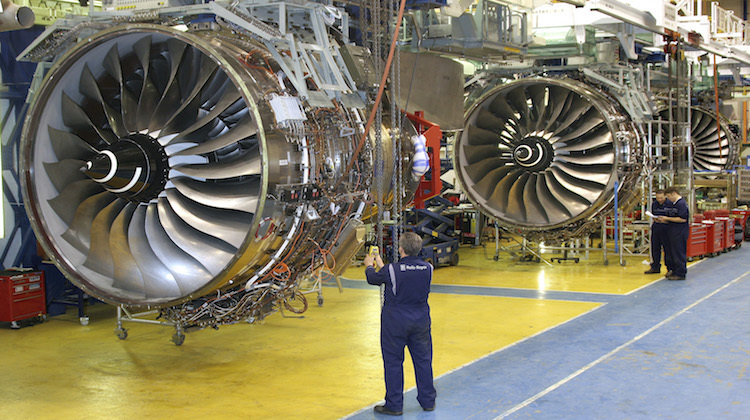 Rolls-Royce said the new inspection regime would have no impact on ongoing proactive maintenance programmes for the Trent 1000 Package B or Package C engines. The company has put aside £1.5 billion ($2.74b) to resolve problems with these engines. It also reiterated its guidance for cash costs on the Trent 1000 in 2019 and 2020 remained unchanged from its February 28 full year results guidance that saw the company report a £1.16 billion ($2.12b) loss. It set aside £100m in February to fix the engine problems and raised an accounting charge to £790m from £554m six months earlier. EASA has issued an airworthiness directive in relation to the the issue. It can be read here. Best of the best,all aircraft engines have some difficulty along the line GE,Pratt and Whitney,CFM etc etc but come on RR are supposed to be leading the pack.This sort of failings don’t happen to a properly tested engine …. This performance is nothing short of shoddy management. Orders may be reflected in this competitive environment. Wasn’t it a Rolls-Royce engine disintegrating that extensively damaged a Qantas A380 just after leaving Singapore? Today’s RR is a shadow of its past. Rapid expansion with inadequate control has consequences. Engines are getting bigger and blades are getting bigger. Thats alot of extra stress on them. Sometimes bigger is not better. If RR is having problems then thats a really big problem. How come all of this neglect is happening all at once? Between Boeing building junk and Rolls Royce fowling up, what is happening with technology? Should’ve gone with GE. GE has always been the leader in engines for wide body aircraft,no reason to choose RR over the original. GEnx series was based on the time proven GE90 which is far more reliable than any RR products. At least it’s not as bad as the 737Max9. A 60 year old airframe with new too-big engines requiring an app to ‘assist’ control. This is a manifestation of the arrogance of RR and inability to engage meaningfully with their customers and suppliers.